Minairons miniatures' ranges will usually have a close relationship with the military history of the nations of the Iberian Peninsula - logically with a special accent on Catalonia, where the brand is born. 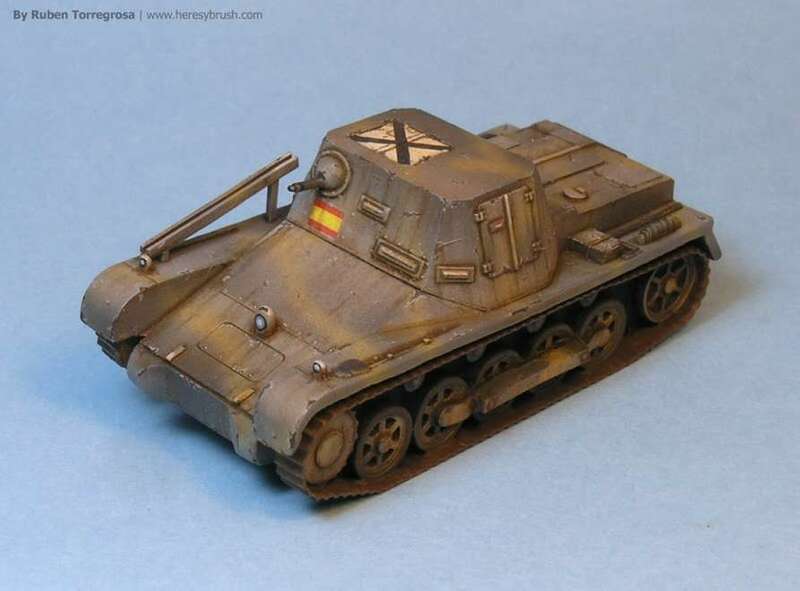 In this manner, the starting range will consist of a selection of Spanish Civil War fighting vehicles, mainly those with a wider use in other Inter-war conflicts, or even early WWII. These are to be released in 1/72 and 1/100 scale first - leaving an eventual 28mm range for a little later, depending on demand and budget volumes. True that, as for detail level, our kits wouldn't stand face to higher detailled examples, certainly. But we're not aimed at such target --but to producing a good wargaming model instead. Technically, the more parts you can divide the model in, the more detail you get. But this implies a higher production cost and, more important, a substantially higher fragility of the finished model. Intended at wargaming as it is, our model must be sturdy --although detailed enough for looking good on a wargaming tabletop. 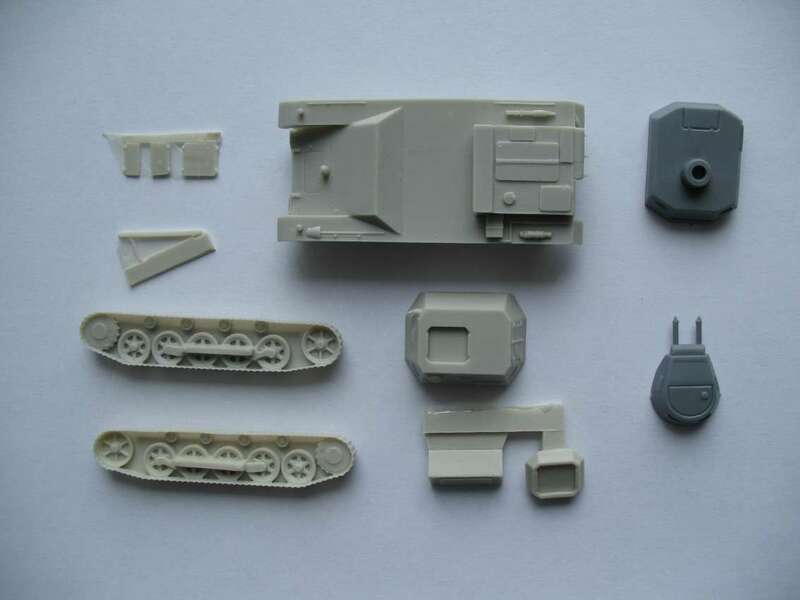 About resin and mixed kits, we realized that some SCW vehicles were so uncommon, or produced in so small numbers, that it would have been unwise to try and produce them in plastic --for the large production needed for redeeming mould cost, face to the unlikeliness to sell them by significant quantities. So we've chosen to derive some models to resin production, instead of plastic. designing process keeps being the same, though: CAD designing from blueprints (whenever these exist) or contemporary pictures. About the Pz. Befehlswagen track units, they're closed around the wheels. There's a resin layer amongst --but too thick for being easily worked, I believe. Not properly one side castings; the visible inner side (lower wheels) has been also worked out. This tank was the result of a commission of the IGC, or War Industries Board of Catalonia, to a tractors factory in the town of Sant Sadurni d'Anoia --henceforth tank's name itself--, by that time held by CNT anarchist trade union. Little time later (around February 1937), three different vehicles were formally presented by them to Presidents Azana and Companys, all three built on a common chassis structure: a so-called Assault Tank, a Universal Carrier and an Artillery Tractor. 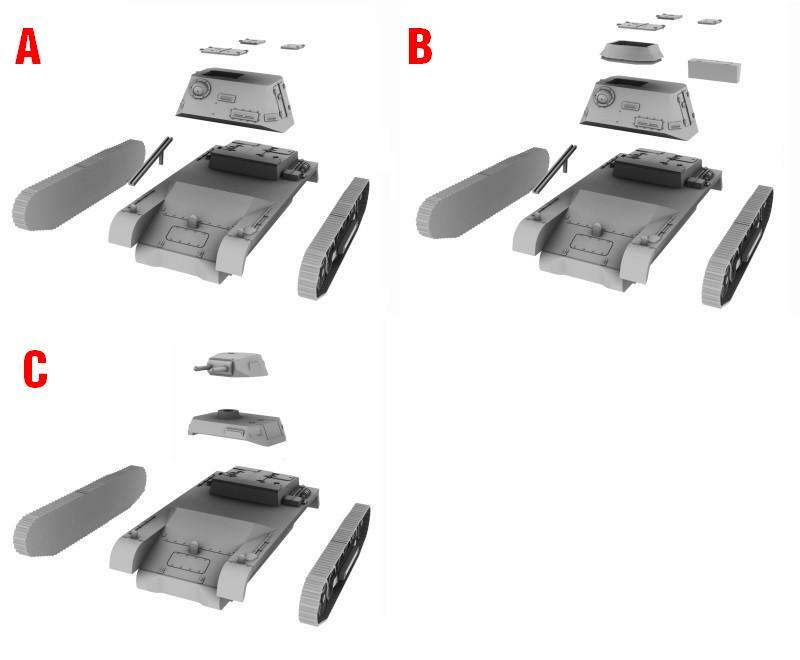 This tank version we've just released was the less fortunate of all three, because it was rejected for mass production. In spite of its mechanical relliability, the tank was too poorly armed with just one Hotchkiss MG and, even worse, it showed no chances of being fitted a turret capable of carrying heavier weaponry. No longer than 3.5m, it weighed close to 4 and was powered by a 60HP Hispano Suiza engine, so it stood on the border line between tankettes and proper tanks. Two prototypes of this tank had been built, whose ultimate fate is plainly unknown. Perhaps they were reconverted into tractors, or discretely diverted by CNT to the anarchist columns in the Front of Aragon, where the lack of modern armour had become dramatic. A short run tank, only 2 prototypes of which were built by a Catalan industry, renowned by their Benach civilian tractors. Rejected for mass production by the Spanish Republic Ministry of Defence; allegedly due to poor weaponry, as well as the unability to being improved by the addition of a rotating turret. It's completely unknown the ultimate fate of the prototypes built --although not unlikely to have been sent anyway to the Aragon Front. Initially intended to serve as an anti-riot AFV, it was the standard armoured vehicle of the Guardia de Asalto police, although some were also delivered to a Cavalry Battalion. Most fought the SCW on the Republican side, although some were captured by the Nationalists. It has been recently known than one or two of these latter were added flamethrowers. 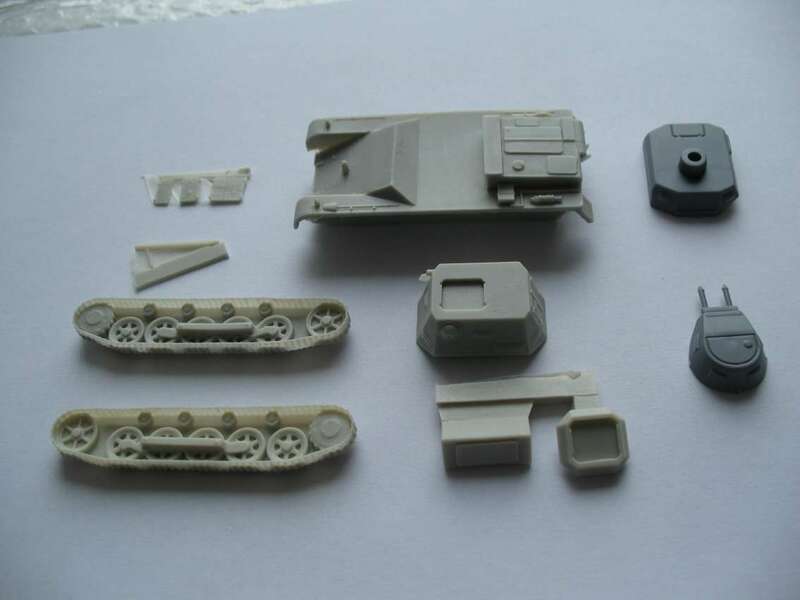 Mixed resin and hard plastic model kit including all the parts necessary to build the model either as a regular turreted Panzer I ausf. B, or a Befehlswagen command tank. This latter can also be built in two different versions. Minairons Miniatures is delighted to formally present its latest production, the Pz. Befehlswagen I ausf. B in 1:72nd scale. This is a kit mostly made in resin, albeit with a couple of optional parts in hard plastic, aimed at allowing you to build the model as a regular fighting Pz.Kpfw I ausf. B. The whole set consists of 10 resin parts, a couple of them also optional, besides of the above commented plastic pieces. 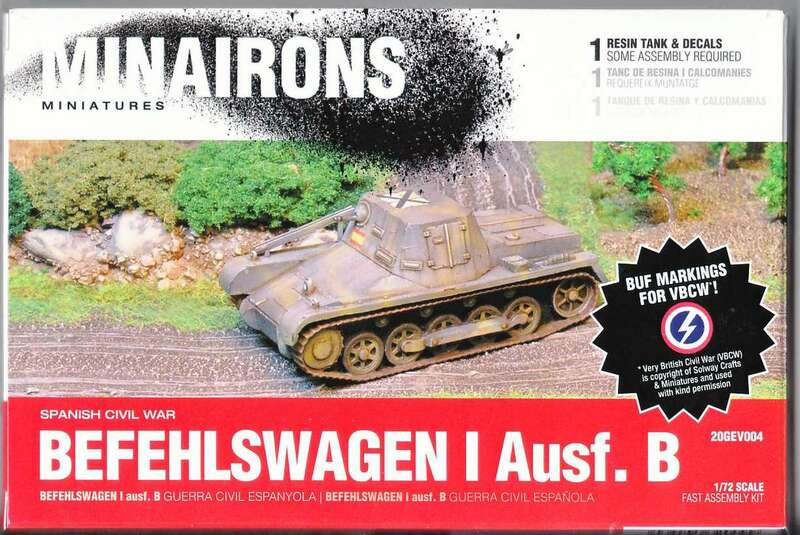 As a novelty with regard to prior releases, this new set is complimented with a decals sheet including not only the expected historical national markings (German, Hungarian and Spanish Nationalist), but also a fictional set. 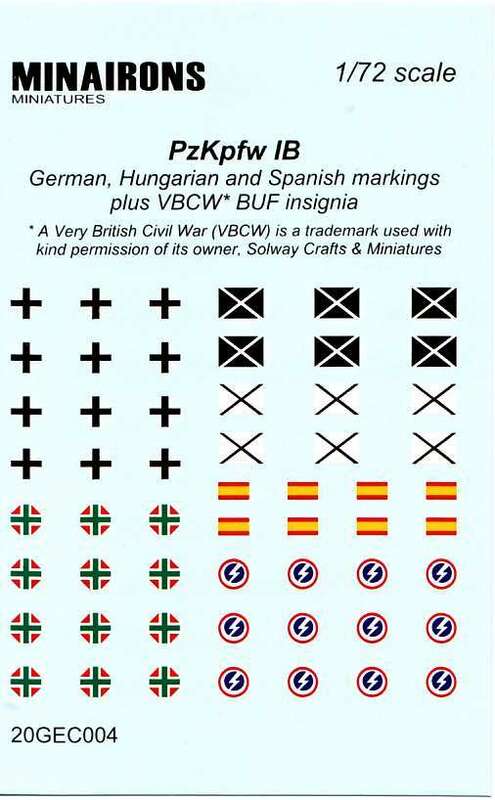 Indeed, sheet also includes BUF symbol roundels for the fictional Very British Civil War (VBCW) setting. 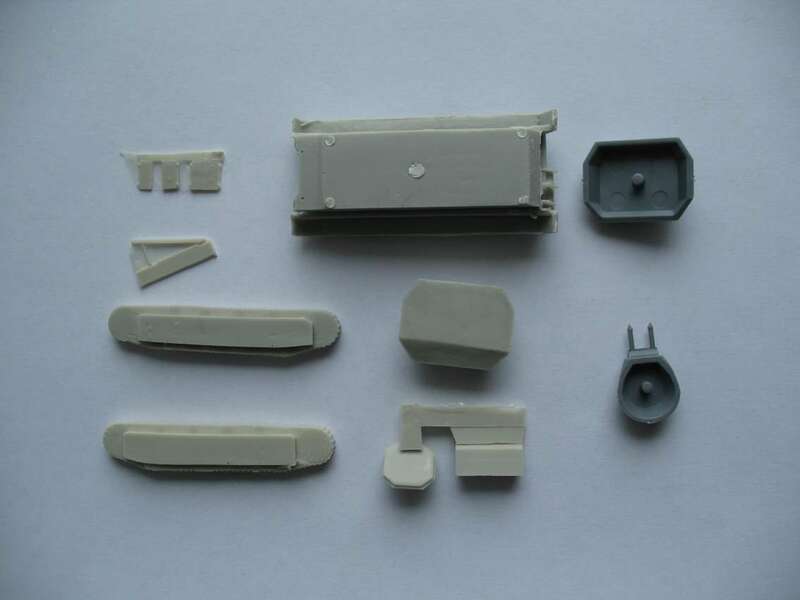 Minairons' T-26 tanks come in a sprue consisting of only 10 parts - 2 of which are intended for an alternative build of the twin-turreted "A" version. Following recommendations issued by several sources including those from a well-known magazine significant contributor, this time the main gun turret includes a hatchet that can be opened, as well as an optional tank commander torso. 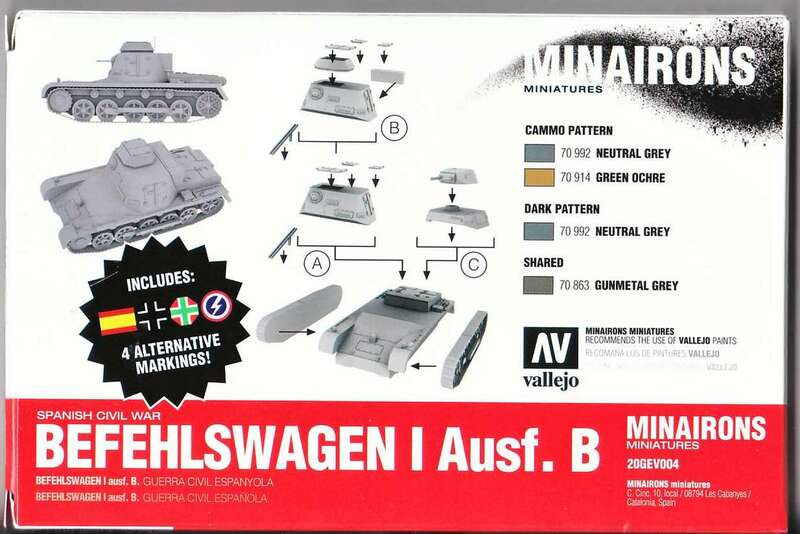 These new tanks are available in a 2-sprues box, also including a decals sheet with national markings for a good number of Soviet, Finnish, Turkish and Spanish (both Republican and Nationalist) tanks. This massive AFV was built on the chassis of the popular Hispano Suiza T-69 heavy truck. Offered with no success to different Security Corps of Spanish Republican and Catalan Governments. Some 5 to 15 were built and fought for the Republic in the first months of SCW. Those not destroyed were captured by the Nationalists, who improved at least one of them by the addition of a T-26 turret. This one was used as high command vehicle. An universal carrier version of IGC Sadurni tank, also short run. 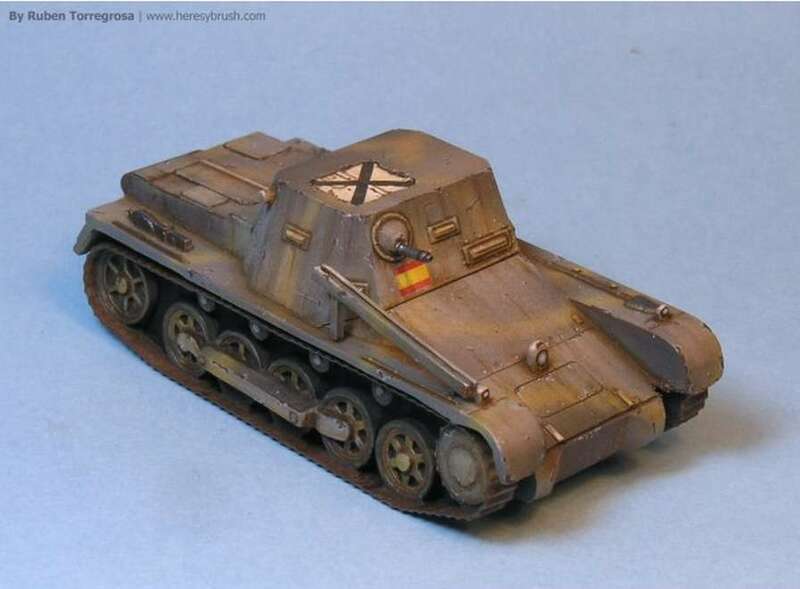 Although rejected for mass production by the Spanish Republic Ministry of Defence, the 4 to 6 already built were nevertheless dispatched to the Aragon Front. Artillery tractor version of IGC Sadurni tank. This one was luckier than other versions. Built and used ceaselessly well up to the Ebro battle. Kit includes a Schneider 155mm howitzer and carriage.